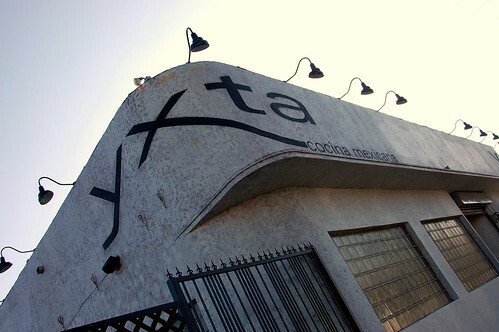 Yxta is one of the many non-divey Mexican restaurants popping up all over Downtown, albeit Yxta's location is not quite Downtown proper. In fact, Yxta is sort of in a not-so-great area, so drive your junker. 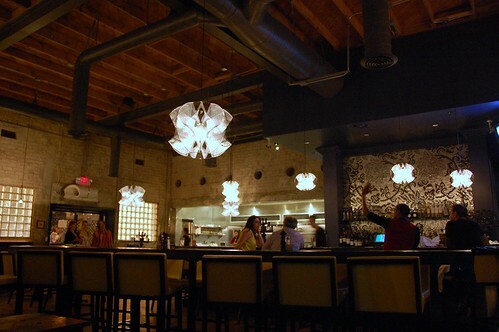 The inside of Yxta looks like it belongs elsewhere (i.e., not in this neighborhood). The patrons are not from this neighborhood either. Most are thirsty yuppies seeking post-work refreshment. This thirsty yuppie came for happy hour with several friends. Refreshing but not strong enough. Not surprising for just $5. Guacamole -- Hass avocado, red onion, cilantro ($6). Fresh and very very good. Really liked the topping of sunflower seeds. 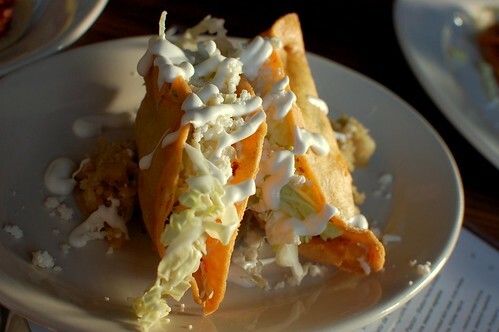 Tacos de papa -- spicy mashed potatoes, cabbage, crema fresca, quesco fresco ($6). The shells were beautifully golden and crunchy, but the potatoes were sorely lacking in flavor. 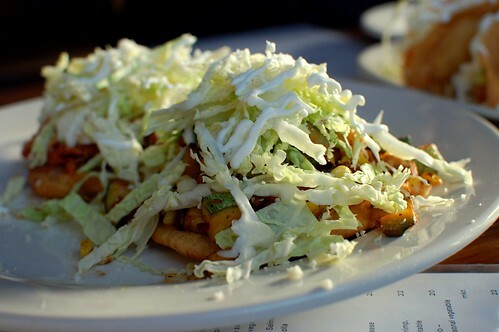 The tacos sat atop even more flavorless potatoes. Spicy? Not even close. 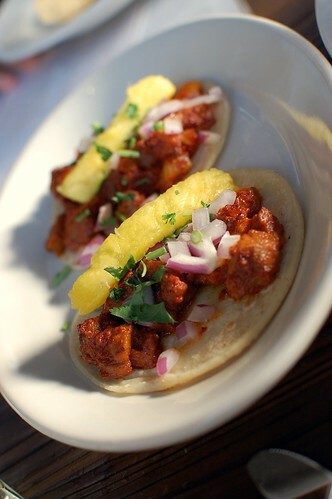 Tacos al pastor -- marinated pork, pineapple, red onions, cilantro ($6). Best of the bunch. Well-spiced and paired creatively with sweet and tangy pineapple. Tacos de carnitas -- slow-cooked pork, guacamole, onion-cilantro mix ($6). 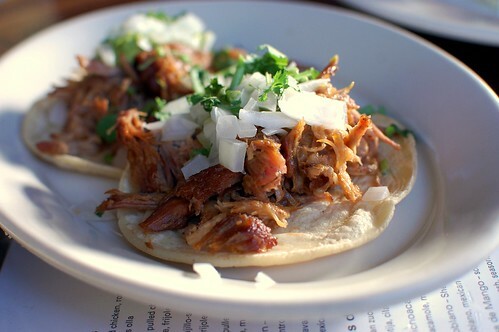 Tasty but nothing beyond your usual carnitas. 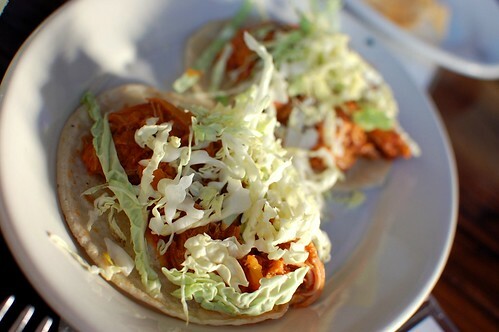 Tacos de tinga de pollo -- pulled chicken with chipotle ($6). These had a decent kick. The tacos de papa could learn a thing or two from these. Sopes de tinga, carnitas, calabacitas, chorizo, pastor with cabbage, crema fresca, frijoles olla, queso cotija ($6). I wanted to love this, but there was just too much going on. It is a great deal, though, if you're just looking for sheer quantity of food and bang for your buck. Gross. Not chipotle-like at all. It was like goopy nacho cheese. 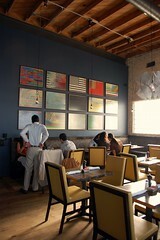 As we left, the restaurant looked like this. 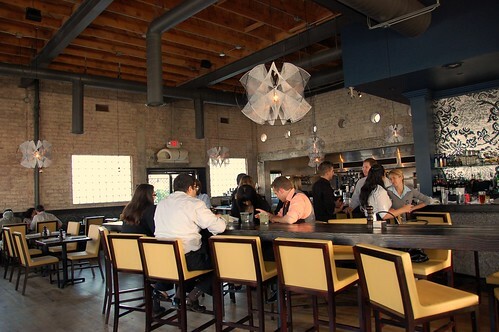 Yxta is a pleasant place to meet for happy hour after work. The food didn't impress me enough, however, for a full-meal return visit. If I'm going to the 'hood, the food has to be good. come visit me in dallas. i'll take you to a million places where you can get the same food (probably better and more authentic) for 1/4 of what you paid. plus, you'll get to hang out with me :-)! I am so incredibly disappointed that the potato tacos sucked. They looked amazing in the picture. 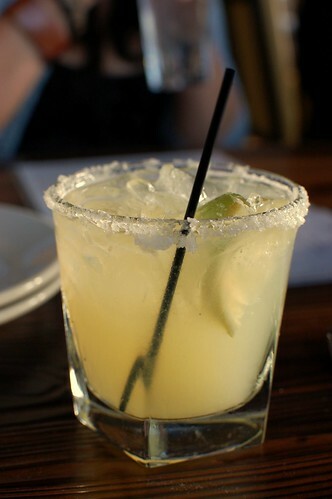 I think the $5 margaritas are enough for a return happy hour visit! I agree with the last sentence. See, reading the first and last sentence DOES work. Genius! Um...I believe you're missing a pic of the BEST thing at Yxta. The Dyson hand dryer. 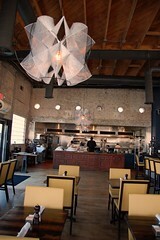 That feature alone is worth going to this restaurant. I'm guessing the place is not pronounced "Yicks-tah?" 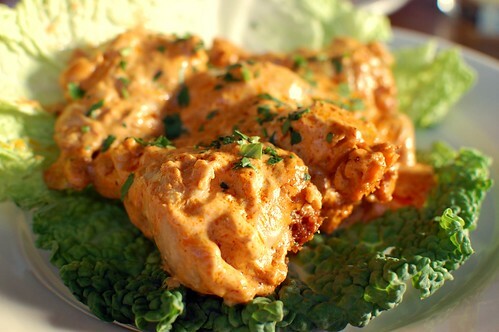 Your pictures of the dishes always make my mouth water. Good thing I read your posts while eating. That's disappointing that a $5 HH margy wasn't that great. It LOOKED good at least. I'm surprised at the food. I think your pictures did it more justice than it deserved. I got excited at the Chipotle wings but sad to hear it just tasted like nacho cheese. Yicks-tah is right. Have you ever eaten any of this cuisine at a street truck/vendor in the hood? I swear when we go back I will venture to eat at one. I bet they have slammin' tacos. You can get al pastor tacos with pineapple for a dollar each on York Blvd.! As for potato tacos, they are a bit bland but if you have some great salsa, then the potato taco becomes that much greater. It's kind of like a delivery mechanism for good salsa. 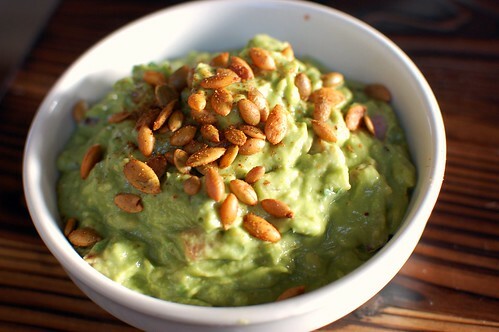 I love the idea of sunflower seeds on guac -- I may have to copy that at home! Too bad the rest of the food wasn't as inspired! that chipotle mess actually looks good to me. yes, i am a hood rat. At least the food photographed well? Sorry it wasn't anything special. But the company was more delicious than the food, right?